Apparently, I have lost my magical power over the universe. Usually, if the weather looks suspect, if I walk to school and get completely ready for the day, school will be canceled. I think it's putting on the lipstick that is the magic moment. It was about as cold as it is possible to get without school being canceled (-13, while -15 is the number at which they don't want children out), but I was fine-- I had four layers on my legs. The newspaper deliverer was skidding a bit on the roads, but it was early. With only three days, the week has been hugely busy. Half the 7th graders needed books set between 1950 and 1973, the other half needed nonfiction, and today all 230 8th graders need a Holocaust fiction AND nonfiction book. That will be a challenge! New books arrived, but they still need a lot of processing, which my volunteers will tackle bit by bit. Last night, I read 8 Food Dude type nonfiction books (I only put half on Goodreads! ), Santopolo's Glam Opening (Sparkel Spa #10), LaReau's The Infamous Ratso, Rissi's Anna, Banana, and the Little Lost Kitten (#5), Surovec's My Pet Human Takes Center Stage (#2), and Meyerhoff's Starry Skies ad Fireflies (The Friendship Garden #5). This order has a LOT of early chapter books and easy readers, since I have a vast number of struggling 6th graders. I finally got to the point with two of my 8th graders where they had read every fantasy book I had. Even Chetwin's Gom on Windy Mountain. I had to break done and get a few titles that weren't exactly innovative in my mind. They won't be huge circulators, but will do okay. Things like The Evil Wizard Smallbone-- still medievalish quests with some magic. Sigh. I want more like The Gauntlet with something other than Celtic or (in the case below) vaguely Germanic settings. That said, I'm going to have about four readers fighting for this series! And you know what I'm reading THIS weekend. Jinx is living with stepparents in a clearing near the treacherous forest of Urwald. To step off the path there is to invite death, so when his stepfather takes him into the woods and has him sit off the path and wait, Jinx knows this is not a good thing. Luckily, the wizard Simon happens upon them, and when trolls come out of the woods, he cloaks himself and Jinx so they are not carried off. His stepfather is not so lucky. Grudgingly, Simon takes the boy home and puts him to work cleaning and helping out. Dame Glammer, a witch with whom Simon deals, thinks the best course of action is just to EAT the boy. Jinx is not entirely sure if she is kidding or not. Simon's wife, Sophie, is not always around, since she teaches somewhere vague and unspecified, and never arrives at the house by the front door. 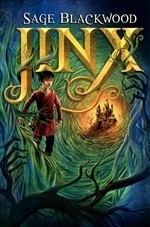 When Simon performs a spell on Jinx that robs him of the ability to see the color of people's thoughts, Jinx suspects that Simon is evil and takes off through the forest to visit Dame Glammer to ask her some questions. On his way, he meets Reven, who has an unspecified curse on him, and Elfwyn, who does as well. Dame Glammer is Elfwyn's grandmother, and the witch suggests that they travel to the Bonemaster to ask him about the curses and Simon. The Bonemaster seems nice, but he is highly suspect, and in the end Jinx is put into a terrible situation. How will the three children survive, and will their questions be answered? Strengths: I appreciated that this had a Germanic/Grimm Fairy Tale feel to it rather than a Celtic?King Arthur one, and I think that fans of Delaney's The Last Apprentice might enjoy the interplay between good and evil in this one. Jinx is an appealing character, and even Simon has his moments, especially with his fun home and his love of cooking. I can see why fantasy fans like this series. Weaknesses: This brought to mind a dozen other similar books (Prineas' The Magic Thief especially), so I would quibble with the dust jacket blurb that says this is "innovative". What I really think: Don't regret purchasing. It will get steady use and last for a long time. Certainly does remind me of the Grimm Fairy Tale stories I loved as a child of the 50-60s. I would enjoy this read. I adored Sage’s Blackwood series! I’ve recommended them to any adult or child who enjoys Dianne Wynne Jones. Currently, many of my students aren’t as familiar with Jones’ work (even though they love Harry Potter & her books are superiour) even though they have seen Ghibli’s Howl’s Moving Castle.